1. Place both fresh and freeze dried strawberries in a blender with the sugar, white rum, gelato and crushed ice. Whizz until smooth and thick. 2. 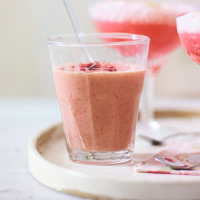 Pour into 2 straight glasses, sprinkle with freeze dried strawberries and serve with straws.